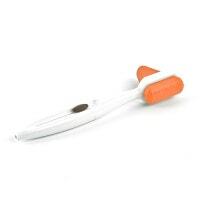 The reflex hammer is used to test the natural reflexes on a living being. It is used, for example, for neurological disorders, suspected herniated discs or in the event of an accident to determine the animal's state of health. 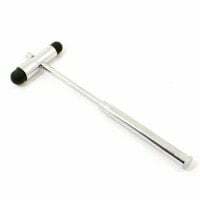 If it is used to tap the body, it is called a percussion hammer. The resulting tapping sound is evaluated by a veterinarian and sheds light on any potential diseases. 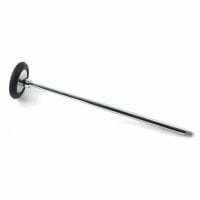 The reflex hammer is available in a range of models, all named after their inventors and, depending on the model, they are also equipped with a needle and brush for additional sensitivity examinations. 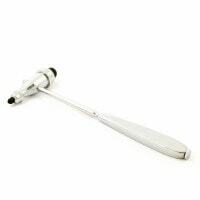 The reflex hammer is available from Praxisdienst-VET in a range of models, such as the Trömner or Buck reflex hammer. You will find reflex hammers in our online shop made of metal or plastic and with a functional head in black, blue or orange. In addition to a variety of instruments, Praxisdienst-VET - the specialist retailer for veterinary supplies - also offers high-quality diagnostic tools, affordable consumables and a large category dedicated to furnishing a veterinary practice. Buy your practice supplies, such as reflex hammers, at good conditions from Praxisdienst-VET - all you need for your veterinary practice!